Scottish Highland Dancing is a celebration of the Scottish spirit. The dances are a spectacular combination of strength, agility, movement, music and costume. Unlike other dance forms, Highland dances are generally danced in competition and are scored individually. Dancers typically dance to traditional Scottish music such as Strathspeys, Reels, Hornpipes and Jigs; all played by an accompanying bagpiper. The dances are made up of different parts, called steps, and there are usually four or six steps to a dance. The dances are great fun and anyone, not just those with a Scottish heritage, who thrills to the sound of the bagpipe can join in and learn the dances. Although historically Highland dancing was restricted to males as a way to keep soldiers sharp on the battle field, today it is mostly performed by females. No matter who dances them, Highland dances require both athletic and artistic skill. Highland Dancing is a healthy workout for adults and children. It is a great way to develop good coordination, posture and overall muscle tone, not to mention aerobic capacity and strength. One study showed that a half hour of dance was equal to a game of soccer. 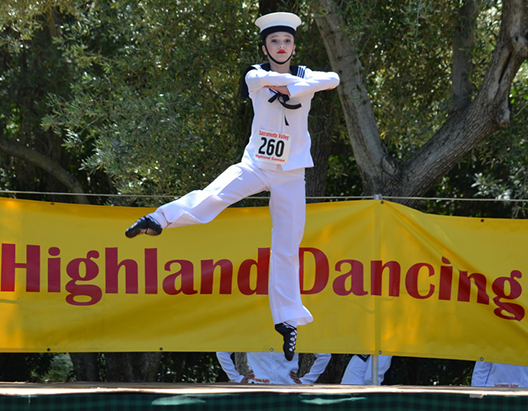 Some competitors perform classic Highland favorites requiring well over 150 jumps in one song. Ambitious new students develop self-discipline and confidence as they learn to tackle the physical demands of Highland dancing. Indeed, the tremendous strength, stamina, and technical precision that accomplished dancers exhibit on stage comes from years of independent training and collaboration with experienced teachers. In addition to perpetuating a wonderful cultural tradition, highland dancers appreciate the athletic challenges, competitive goals, and performance opportunities. It also affords the opportunity to meet, and become lifelong friends with, dancers from around the globe. The benefits of Highland Dancing include changes in cognitive perception, physical health, personal growth and development. Highland dance plays a significant role in the education of children, as it integrates and nurtures cognitive and motor skills. Left and right brain development is enhanced, as there is logical positioning of feet, hands, and head. Dancing helps direct body movement in space and to pace movements to music. Accuracy in timing is important to the brain process responsible for problem solving and reasoning. Something as simple as hopping requires calculations relating to spatial awareness, balance, intention and timing in the brain’s sensorimotor system. Highland dance provides a sound platform for developing flexibility, muscular strength, balance and co-ordination. Lung capacity and endurance is increased due to the highly athletic nature of the dance form. Both fine and gross motor skills are developed in the learning and performing of intricate Highland steps, thus improving muscle tone. Good posture is nurtured, as this is essential for efficient movement both inside and outside the dance class. Highland dance provides a platform for solo and team dancing, traditional and choreographed steps, dancing for pleasure and competitively, as well as shows and exams. A sense of self-discipline and confidence is developed which places a dancer in a good position when having to deal with interviews and presentations later in life. The dancer gains a sense of balance in life as they learn to manage their time to keep commitments in both dance and school. Lifetime friendships are built as team work and team spirit are fostered. Dance is a fundamental form of human expression that evolved with music to generate rhythm. Dancing encourages innovation and the use of imagination leading to expression and non-verbal communication. This is instrumental in developing young people’s creative and artistic skills. Dance is not just about “steps” taught and accolades gained – it gives the tools needed for a successful life journey. This is the oldest of the traditional dances of Scotland. According to folklore, the old kings and chiefs of Scotland used the Highland Dances as a way of choosing the best men for their entourage and men at arms. These dances tested a warrior’s strength, stamina, accuracy and agility. The ancient warriors and clansmen performed this dance on the small round shield (called a targe), which they carried into battle. Most targes had a sharp spike of steel of some 5 to 6 inches in length projecting from the center, so dancers learned early to move with great skill and dexterity – a false or careless step could be more than a little painful. The dance is said to have been inspired by the adventures of the stag – the dancers upraised arms representing the animal’s antlers. Danced vigorously and exultantly, it is now highly stylized and calls for the greatest skill in technique and exactness of timing. There is no Highland Dance older or better known than the Sword Dance, or Ghillie Callum. The Sword Dance is the ancient dance of war of the Scottish Gael and is said to date back to King Malcolm Canmore (Shakespear’s MacBeth). Tradition says the original Ghillie Callum was a Celtic prince who was a hero of mortal combat against one of MacBeth’s Chiefs at the Battle of Dunsinane in 1054. He is said to have crossed his bloody claymore (the two-handed broadsword of Scotland) and crossed it over the sword of the defeated Chief and danced over them both in exultation. This dance of exultation became a tradition among the highland warriors, and in subsequent battles, clansman would cross their swords and dance around them in the same way. In addition to being a test of skill and agility, it was believed that if they could complete the dance without touching the swords, it was a good omen that they would be victorious in the coming battle. However, to touch or displace the swords was a bad omen and was indicative of losses or even defeat. The dance performed at the Highland Games today focuses on technical accuracy and the precise placing of the feet. Completion of the dance without inflicting self-injury necessitates appropriate placing of the feet and rapid body turns, and as a result, is an extremely exciting visually display. In the first step the dancer performs the steps outside the sword or “addresses” the sword. Subsequent steps are danced over the crossed blades, but notice that once inside the blades, the dancer never dances with his back turned to the swords – only a fool would turn his back on a weapon. It requires tremendous dexterity not to displace the swords. This dance originated as a political protest dating back to 1745 when the wearing of the kilt was an act of treason. Pronounced “shawn trews”, this Gaelic phrase means “old trousers”. The beautiful, graceful steps reflect the restrictions imposed by the foreign trousers the Scots were forced to wear as part of the Act of Proscription that made wearing “the Highland Dress” including tartan or a kilt illegal in Scotland. The lively quick time in the dance recreates the Highlanders’ celebration of rediscovered freedom when the law was repealed in 1782. Legend has it that the reel originated outside locked church in the Highland village of Tulloch, where it was danced by chilly parishioners as a method of keeping warm while waiting for a tardy clergyman. Of all the Highland Dancing events in which the competitors vie, the reels are the closest to approach social dancing. While the teams consist of four dancers, the judges mark each competitor individually. The National Dances are more modern than the Highland Dances and some were developed so women could participate. The costume worn by women is called the Aboyne dress named in honor of the Aboyne Highland Games in Scotland where women were forbidden to wear the traditional Highland outfit. The National Dances are much more rhythmic and balletic; however, they still require quick and precise movements. Men, of course, also perform all of the dances, but they wear the traditional Highland outfit. The Scottish version of the Irish Jig is meant to parody an angry Irish washerwoman when she finds out some neighborhood boys have knocked all of her clean wash to the ground. The Sailor’s Hornpipe requires strength and stamina to mimic in dance a variety of shipboard tasks including swabbing the deck, climbing the ship’s rigging, searching for land, standing watch and hauling in rope. The Hornpipe is danced in a British sailor’s uniform. The name “hornpipe” originally comes from a crude English folk wind instrument made from either wood or ox horn and was common throughout Great Britain in the 1700’s. Small, cheaply made and not requiring any great skill to master, it was the instrument of the common folk. With the limited space aboard ships, it became popular with sailors. Later the name hornpipe became attached to a number of tunes in a particular rhythmic style, and still later the dances accompanying that style also became known as “Hornpipes”. To register for Highland Dance competition, please click the button below and scroll down to “Competitors”, enter “1” in the dropdown box on the right side, and the code “dance” to view registration form.